The thyssenkrupp plant in Ilsenburg is in a celebratory mood. Exactly twenty years ago the industrial concern from Essen opened this automobile supply site in the district of Harz in Saxony-Anhalt. Today, more than 700 people are employed at highly modern workplaces manufacturing engine components for different vehicle classes. 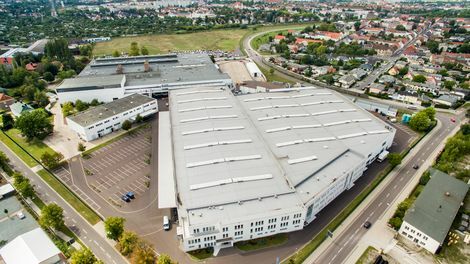 Primarily, built camshafts and (in their further development) ready-to-install and variably adjustable valve train modules are manufactured in Ilsenburg. Camshafts in combustion engines ensure the control of the inlet and outlet valves of the cylinders. They are decisive for the perfect functioning of the engine. “The design of the engine components, specially developed by the company, is essential for entrepreneurial success and the growth of production in Ilsenburg. With this we are reacting to the globally persistently high demand for efficient and drive systems with low CO²-emissions”, says Frank Altag, CEO of the Camshaft Group at thyssenkrupp. The camshafts built from different materials are more than 30 percent lighter and show a higher-performance than conventionally cast camshafts, he says. “The valve train modules”, says Altag, “are also distinguished by substantially lower weight and fuel consumption.” Optimised bonding techniques made it possible for thyssenkrupp to further develop the design. Components for electric engines have been newly developed during the past few years on the basis of this know-how. For example, rotors for electrical vehicles will soon be produced on a large scale in Ilsenburg. “The building up of new plants around the world has been guided from our site in the Harz in the past few years”, emphasises the Managing Director of the Camshaft Group. The company is now producing at a total of ten sites all over the world, including in China, the USA, Mexico and Brazil. The Ilsenburg site is one of the world’s leading producers of drive components. Every year, more than five million vehicles have been equipped with the products from Ilsenburg alone. The customers include well-known automobile manufacturers such as BMW, VW, General Motors, Ford, Audi, Porsche, PSA, Volvo, Iveco, and the Fiat Chrysler Group. In order to be able to face global competition, there also always has to be a demand-related and intelligent production control as well as product innovations. On the threshold to Industry 4.0, smart factories that operate independently, flexibly and are adaptive are an essential competitive advantage. The Ilsenburg plant of thyssenkrupp is well equipped for the transition into the digital age. A company from Wernigerode that develops electric engines for highly specific requirements is attracting attention with the slogan “Krebs & Aulich – weird electrical machines”. This company from Harz was one of the first to focus on the future market of e-mobility. Almost ten years ago, a field experiment was launched together with the Fraunhofer Society in which fourteen Audi A2 were converted to electrical drives. “We regularly check the twelve still running Audi A2, which are used by private people, administrations, and companies. The results are incorporated in the further development of the electrical drive concepts”, says Krebs & Aulich Managing Director Martin Sobczyk. The core business of the company, however, is the manufacturing of drives for automobile test benches. “Everyone who develops automobiles, drives, or components for it tests these with machines from Krebs & Aulich”, says Sobczyk with pride. The company is globally regarded as the technological leader of the industry and is often asked for advice on research projects. To meet the rising requirements, Krebs & Aulich is currently developing a new generation of test-bench engines, based on the latest calculation and simulation methods. “Our objective is to have even higher-performance, more efficient test-bench engines individually adapted to the customer”, says Sobczyk and draws attention to another research project: Together with the Magdeburg-Stendal University of Applied Sciences and three producing companies from mechanical engineering and metalworking, Krebs & Aulich GmbH is developing a new type of technology for the manufacturing of test-bench engines. The aim is to achieve effective and practicable production with the highest quality standards, especially for the rotor. The company’s own research and development department has since grown to 16 employees. The company is present in China. Since 2016, Krebs & Aulich has been operating its own branch in Shanghai, in order to handle distribution and service on site in the “Middle Kingdom”.